To my astonishment, two pups, closely resembling German Shepherds, came racing up the back lane one August day. Across the front field they frolicked and disappeared beyond the road. These Coyote pups, born in May, are intelligent, curious and playful. They have exceptional hearing and a very keen sense of smell. As well, they are remarkably fleet of foot and can trot along comfortably at 20 to 30 kilometres per hour. They can also jump 5 metres in length and as high as 2 metres. Coyotes are monogamous. Pairs mate in February or March. The female digs a den or renovates an old den for the birth of three to seven pups. The young will be capable of mating by their second year. While I watched, a coyote picked up each apple, which had fallen to the ground beneath a tree, throwing back his head every time to capture all of the juice, when he chewed in obvious enjoyment. Although 80% of their diet is mice, rabbits and chipmunks, Coyotes will eat almost anything. I have seen a male bring his famished and nursing female to a pile of corn, which had been left to attract Wild Turkeys. She devoured the corn with obvious gusto, while he sat and waited. Originally, the Grey Wolf occupied all of Ontario and was present here in Puslinch in packs, when the first settlers arrived but was eradicated from the south much before the 20th century. Gradually then, after the European immigrants to North America cut the great forests, the coyote, a native of the western American grasslands, began to expand its range. About 1900, it moved into Northern Ontario, where it interbred with the Grey Wolf. Thus, what is now termed the Eastern Coyote or Brush Wolf is significantly larger than its western cousin. My uncles, Dan and Howard Clark, hunted Brush Wolves, which appeared in Puslinch during the 1950’s. Its name is a Spanish version of the Aztec word “coyoti”. It is one of seven representatives of the Canidae family in Canada. Its long, soft fur is variable in colour from brownish-yellow to reddish-brown, yellowish-grey or tan. Its coat will be darker in colour in summer and lighter in winter. It has yellow eyes, wide, pointed, erect ears and long canine teeth. Occasional examples of the species may quite remarkably resemble a German Shepherd. The male is larger than the female. Like the Grey Wolf, it howls and yelps in packs, especially at dusk. It also can bark and growl like a domestic dog, wail and squeal. This extremely adaptable animal can become accustomed to urban life, as the cities of Ontario continue to expand into its country territory. As to food sources, humans provide a veritable buffet of food scraps, livestock and pets. As one Morriston resident put it, “Coyotes can’t go to restaurants”. Therefore, the wise and caring pet owner will keep all pets inside from dusk to dawn. Cats and small to medium size dogs should be accompanied by a human, while outside during the day. Large dogs should not be allowed to chase coyotes as, while the big dog may be a match for one coyote, two or more may turn around, face it and overcome it. In Puslinch, they have been known even to kill and injure Dr. Colin Peace’s penned Ostrich. If your pets are mysteriously disappearing here in Puslinch, they have likely either been struck by a vehicle or eaten by a coyote. The best defence for livestock may be Great Pyrenees and Maremma dogs, both bred for guarding flocks. Like dogs, coyotes are susceptible to parasites like mange, heartworm and hookworm, and diseases like distemper and rabies. 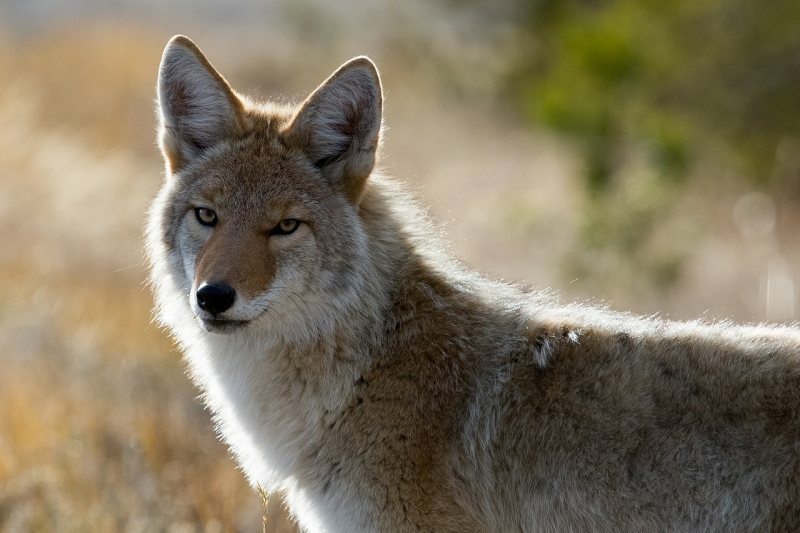 Within the past 20 to 25 years, as subdivisions encroach upon rural areas everywhere, it has become common for the media to feature stories of coyote sightings in urban areas, reports by shocked owners, of pets being chased, bitten or carried off by coyotes and expressions of worry about their children, by fearful parents. Most cities now post a website page addressing how to co-exist with coyotes, the only solution if we plan to see wild animals in the wild in the future. Truly an amazing animal, unlike almost all other species, it has survived all attempts by man to extirpate it from the face of the earth.